Light pipes can be very useful for manufacturers in industries ranging from aircraft instrumentation to health care, as well as the devices we rely on to make our lives easier at home. But first, what the heck are light pipes? Light pipes are clear tubes that transmit light from a light source, such as an LED to a user interface. 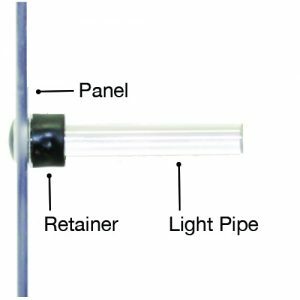 Designed to carry light short distances with high efficiency, light pipes can bend light around corners and tight spaces delivering excellent visual indication with minimal loss of light intensity. How do light pipes work? A light pipe is placed very closely to an LED light source on one end of a PCB board. Its optical-grade materials help carry the rays of light to the desired destination, typically at the user interface of a device. Light pipes transmit roughly 80 to 90 percent of the light from the LED source, depending on design and spacing. The closer the light pipes are to the LED(s), the more efficiently they can transfer light. Of course, the light pipe(s) used will need to be rated for the same amount of heat that is produced by the LED or light source, so that must be a design consideration as well that can dictate the minimum allowable distance between the light pipe and the light source. Why use a light pipe? Depending on the equipment and the design of the user interface of a device, a product can require more than one — and up to many — indicators. For designs that require multiple indicators, light pipes are an ideal solution due to their low cost, excellent visual communication and design flexibility. Light pipe – the term “light pipe” can also be called a “light guide,” or “light tube.” To make things more confusing, they’re sometimes called “litepipes”, too. 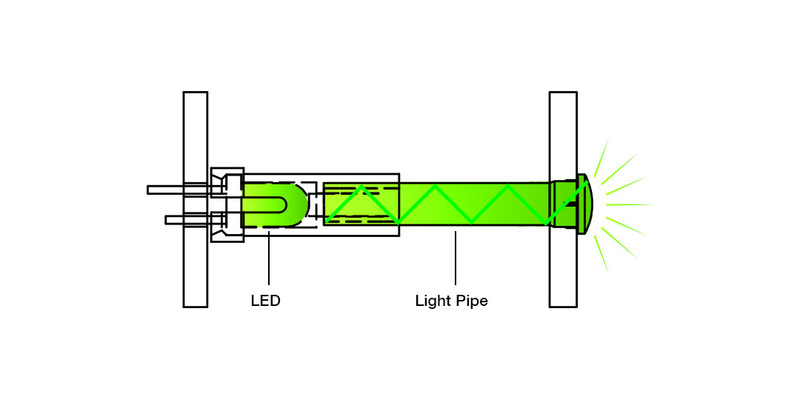 A light pipe is a rod made of optical acrylic or polycarbonate that transmits light from a light source, typically an LED, at the circuit board to the panel of the device. These light pipes are ideal for carrying the light in a small space, like a status indicator or control panel. Light diffuser – light diffusers are used to spread light from an LED source over a defined area, but also reduce the brightness of the light it transmits. Therefore, light diffusers are typically made of opaque materials. Light diffusers can be used in conjunction with light pipes or light guides. 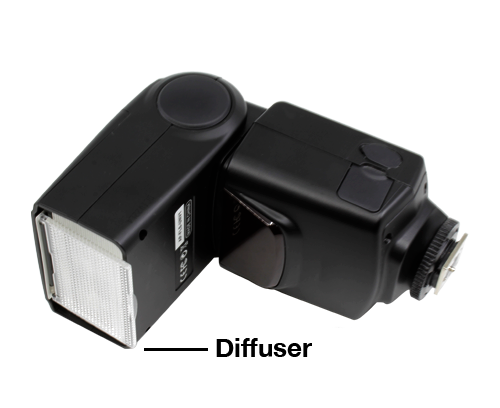 They also increase the viewing angle and are ideal for soft illumination of defined areas. For this guide, we will be focusing on the fundamentals of LED light pipes, or litepipes, if you prefer that spelling. • Greater flexibility and control over – by adjusting the length, angle and spacing, designers can get the exact visual indication and uniform light visibility they desire with the right light pipe design. 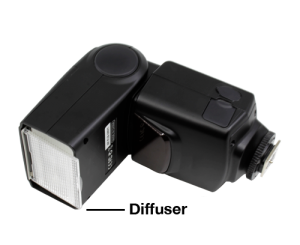 • Minimized light leaks – when excess light shines through a device without illuminating the indicator properly, it leads to wasted light and provides a poor user experience in the final device. By selecting the right light pipe and optimal placement between the LED and panel, it delivers optimal illumination without losing light. • Easy installation – no matter the type of light pipe, the installation can be literally a snap with a snap fit or press-fit light pipe. • Production efficiencies – when a device has multiple panel mount indicators (PMIs), the production costs can really add up. Light pipes are a great alternative that brings down the cost without skimping on reliability, design flexibility or visual indication. Like with any new product design, the decisions made early in the process can shape some of the constraints that must be accommodated later in the process, from the size of the PCB to the amount of space on a panel. These decisions may not seem like that big a deal, but when light indication or user interface decisions are made early-on, the manufacturers — and ultimately the end users — win. Light pipes are available in a variety of styles and can suit a host of LED mounting options. To really maximize efficiencies in your product design, you need to know the pros and cons of the different types of light pipes. They typically fall into two major categories: rigid and flexible. Rigid light pipes are meant to be used in applications that where the light doesn’t need to bend around a corner or angle. Therefore, these do not bend like flexible light pipes. They’re made of polycarbonate rods that transfer light from the PCB to the user interface. Rigid light pipes are meant to be used in devices where the light only needs to travel a short distance from the PCB and panel, compared to flexible light pipes that transmit light longer distances. Although rigid light pipes do not bend themselves, they can still move light around right angles and tight corners. Flexible light pipes are the exact opposite of rigid light pipes. 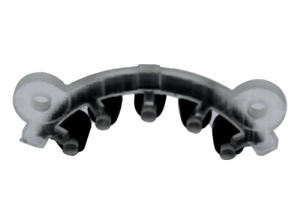 They are made of a polycarbonate fiber that is designed to be extremely flexible. These bendable properties make it possible to transmit light around corners and tight spaces without losing much energy. What are light pipes made of? 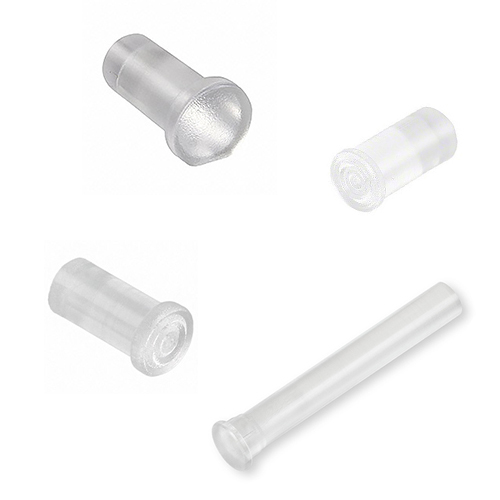 Light pipes are commonly made of either optical acrylic and polycarbonate materials. Both of these materials are lightweight, yet durable. They also possess the optical properties manufacturers require for a variety of applications. Compared to polycarbonate, acrylic is hands down more superior when it comes to optical properties. It’s easy to mold, naturally UV stable for indoor use and transmits light better than any plastic material available. So why wouldn’t you always use acrylic as your go-to light pipe materials? There may be instances where you need a more durable light pipe that still performs well, but also provides more resistance to heat. That’s where polycarbonate comes in. Polycarbonate light pipes provide outstanding light transmission, while being more suitable for higher-temp operations. Polycarbonate is also available in UV stabilized grades that are ideal for outdoor use. 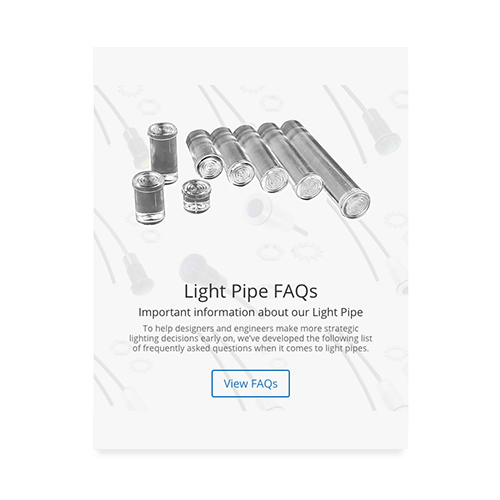 So, how do you choose the best light pipe for your application? If flexible and rigid were the only options, your options may be limited. 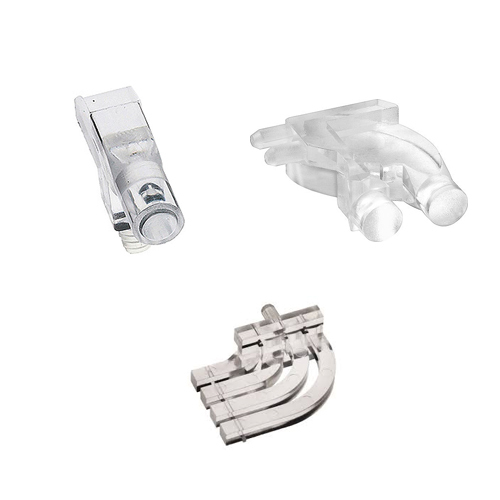 Light pipes are designed to accommodate a wide range of mounting types. In addition to the rigid vs. flexible decision, there are several other considerations when choosing a light pipe for your design. 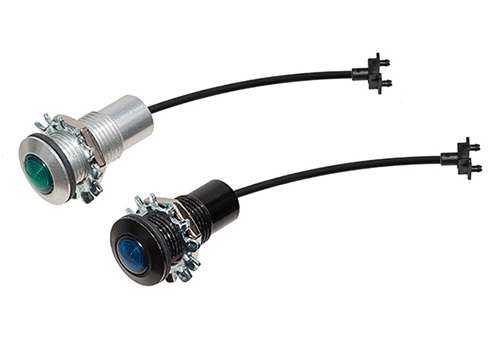 Fortunately, many work with various mounting types, so if you are constrained by the type of power source or placement of your indicators, chances are, there’s a light pipe that will work for your needs. 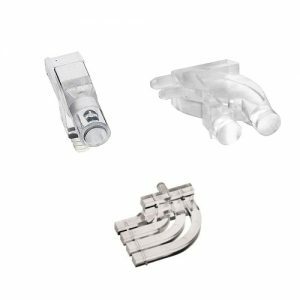 Panel mount light pipes – like the name implies, panel mount light pipes are those that are attached directly to the control panel or user interface. 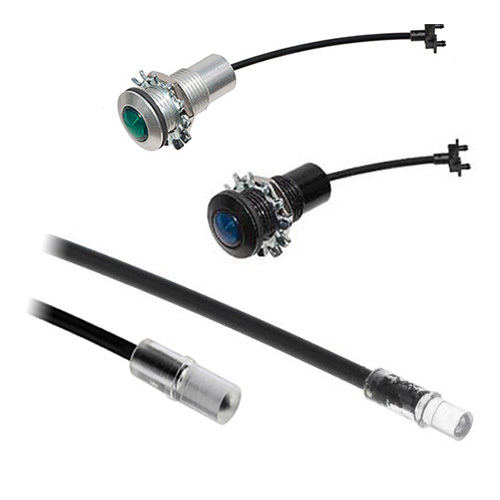 Surface mount – light pipes that are mounted to the control panel of the device instead of the PCB or circuit board. Surface mount light pipes are designed for streamlined production and assembly. The PCB board can be printed in one line, the panel in another and then they can be machine-assembled saving time and costs vs. manual labor. Right-angle – when 90-degree angle alignment to the LED or PCB board is crucial, right angle light pipes are available in multiple options, including 1-position, 2-position, 3-position and 4-position board-mount options. So when you’re specifying light pipes, there are several decisions to make right off the bat. Fortunately, some of them will be made for you as other options are eliminated. Panel mount or board mount? Right-angle through-hole LEDs work well with flexible light pipes that are mounted to the PC board or panel. For LEDs that are surface mounted to the panel, flexible and rigid light pipes are options available. Rigid LED light pipes are ideal for several industries and applications, including audio equipment, portable devices and even mission-critical aviation equipment. When you’re several hundred feet in the air is no time to question your aviation system’s status. See how a board-mounted light pipe solution enables clear and reliable communication day or night, even at a 140 degree viewing angle. 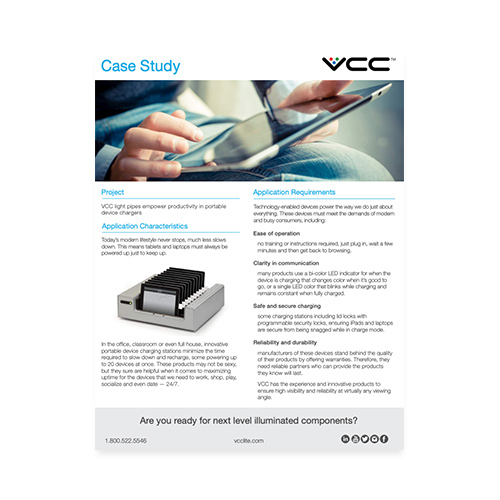 Read case study. Powering up to 20 devices at once requires reliable and intuitive communication. Light pipes like the LFC Series provide a soft, uniform glow and a wide viewing angle of 120 degrees for across-the-room indication. 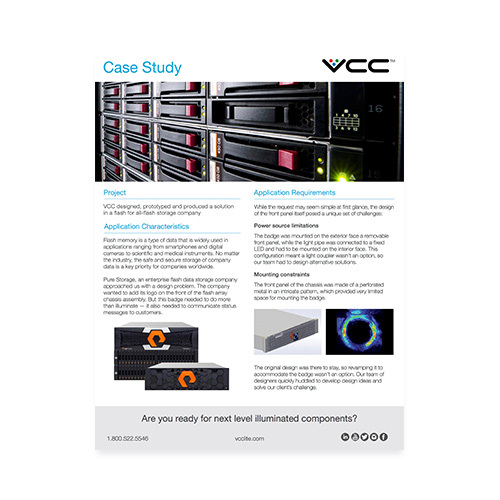 Read case study. Handmade audio equipment like mixers, preamps, compressors and mic presses need reliable indication for adjusting levels various inputs to create distortion and signature sound. High-intensity LEDs pair well with rigid light pipes with crushable ribs for easy, secure installation. 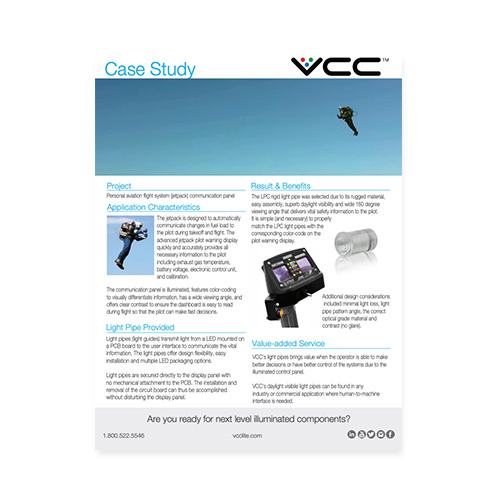 Read case study. From hostile weather and the elements to vandalism, parking meters can really take a beating. But they must also reduce glare for day and night operation, especially when parking tickets are at stake. This flexible light pipe solution provides NEMA 4 and IP-67 Ratings to protect from shock, vibration and even ESD protection. 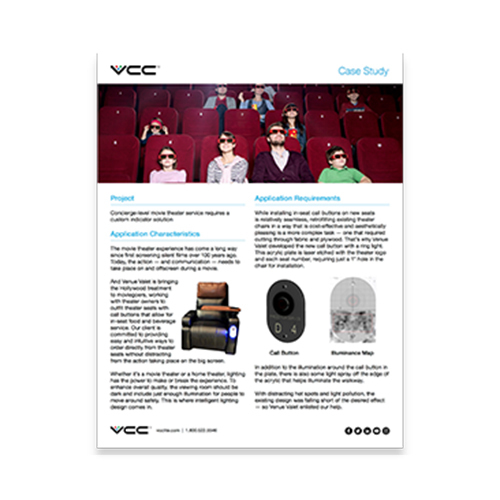 Read case study. For light pipes that will be operated in outdoor or high-vibration environments, there are several ways to help protect and secure them for continuously reliable operation. Both rigid and flexible light pipes can be moisture-sealed for use in outdoor and harsh environments. From crushable ribs and gaskets to retainer rings, there are several options to help seal in moisture and attain the IP or NEMA rating of the light pipe you need. In addition to moisture, some applications may require shock and vibration resistance as well. Some light pipes, like the FLXR Series litepipe protects from all the above, and has electrostatic shock discharge (ESD) protection. How many indicators are needed? How far apart will the power source and LED be? How will the light pipe be mounted? How far does the light need to travel? Around curves and angles? How much room on board or panel? For outdoor and high-moisture environments, there are several ruggedized light pipe solutions available. Look for products with Ingress Protection (IP) and NEMA ratings that align with your product’s needs. For industrial and other high-vibration environments, additional hardware may be needed to secure the light pipe in place. 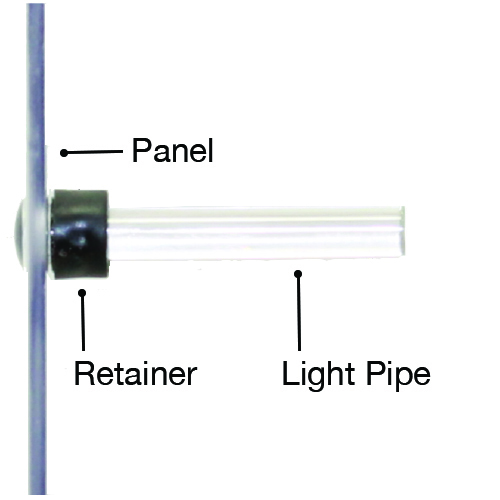 Flexible light pipes can be secured with either a grommet retainer or a spring retainer, depending on their length. DC power supplies demand safe and reliable operation on job sites. This low-profile, rigid light pipe solution delivered maximum brightness and minimal light loss. 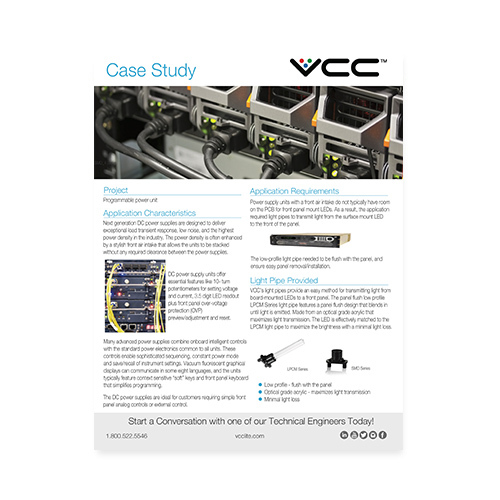 Read case study. Be sure to review your product’s data sheet carefully as each light pipe will have its own properties. Of course, light pipe position can impact the light properties. To minimize light loss, a general rule is to use an LED with a narrow viewing angle of 160 degrees or less and position the light pipe and LED no more than 0.05” apart. There’s a little more to it than that to get the best product for your design. That’s where light simulations come in. Contact our team to run a simulation and determine the ideal light pipe for your design. Even with all of the design options available in standard flexible and rigid light pipes, there’s still plenty of need for a custom light pipe solution. Having a custom light pipe designed for your application may seem expensive, but you may be surprised at how affordable a custom design can be, often ranging from $500 to $5,000 (not including tooling costs). Do you need help with design and production, or just design? 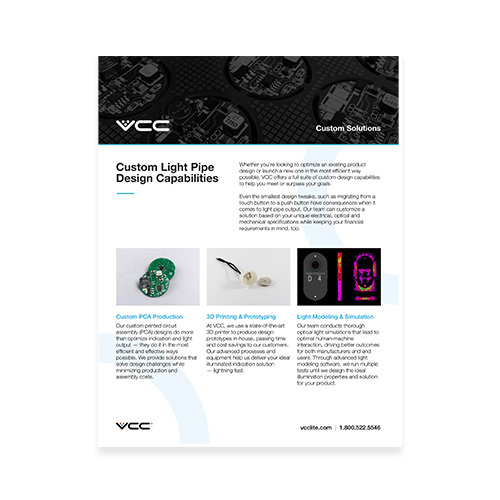 VCC uses this input to design a custom light pipe or PCA assembly. The team conducts ray tracing simulations using the latest light software to determine exactly how the light pipe will perform. The design is then revised and optimized until the ideal optical requirements are met. Once the light pipe specifications have been perfected, we use 3D printing in-house to create a functioning prototype. The prototype is tested via light performance study and any mechanical, electrical and optical changes are made as needed. When the design has been perfected, the light pipe moves into production where it will be ready for assembly within a few weeks. The whole process can take as little as 2 weeks or as long as 12 — it all depends on the complexity of the design. What are some examples of custom light pipe designs? A custom PCA assembly and eight small light engines were designed to optimize an in-theater call button for foodservice. Read more here. A custom, illuminated logo on a front panel where limited space and design constraints required an innovative solution. Read more here. Over the last few years, 3D printing has changed the game in light pipe prototyping, allowing some manufacturers to use in-house printers to dramatically reduce production times. Shaving days or weeks off of a timeline is a huge benefit for designers and OEMs, but 3D printing can also provide a less common advantage: completing small light pipe runs to be used in actual products. 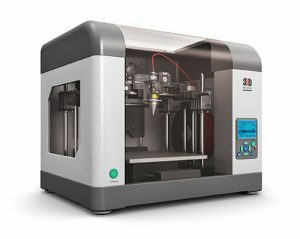 VCC’s in-house 3D printer can print light pipes using photopolymer resin with different additives, then hand polish them for use in products. 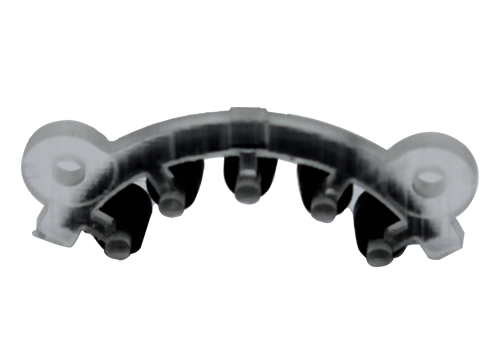 These in-house printed pipes can match approximately 82 to 95 percent of the light characteristics delivered by going the injection molding route. In this case, doing a small, pilot run could give OEMs and designers the quantity they need to verify the concept of their final product. A well-designed human-machine interface (HMI) can deliver faster throughput and reduced downtime. Custom, flexible — and even rigid — light pipes open up a wide range of design possibilities by providing greater flexibility and control. And making indicator decisions early on in the design process can help you maximize efficiencies and get exactly what you want in the finished design. This includes visibility of status indicators from distances that help the end user maintain safe and reliable operation. 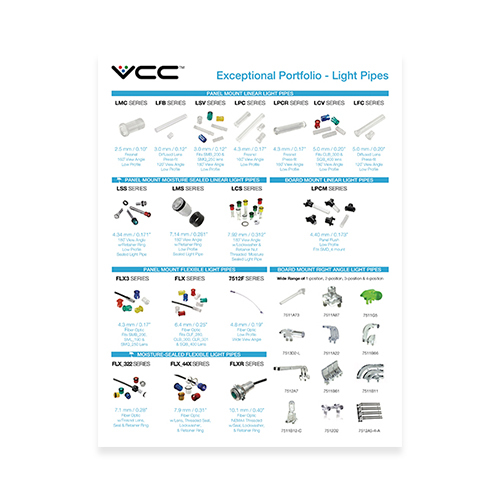 To learn more, check out the light pipe FAQs page or VCC’s light pipe portfolio. Have a project that needs a light pipe? Let us help you find or create the perfect illuminated solution.